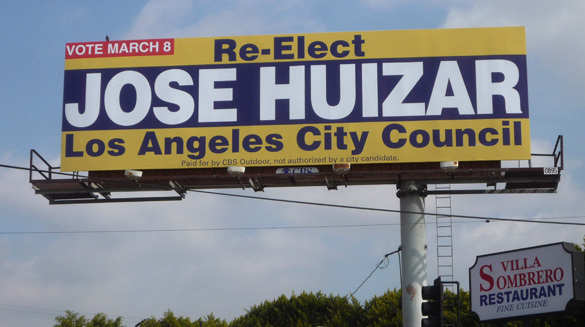 With the March 8 election just days away, CBS Outdoor and Lamar Advertising are providing thousands of dollars worth of free billboard advertising to Jose Huizar, Bernard Parks, and four other incumbent council members running for re-election. The move invokes memories of 2001, when billboard ads donated by Clear Channel supporting Rocky Delgadillo’s election to City Attorney have been credited with helping defeat his opponent, Mike Feuer, an outspoken critic of the billboard industry. Huizar and Parks are both facing well-funded challenges to re-election. 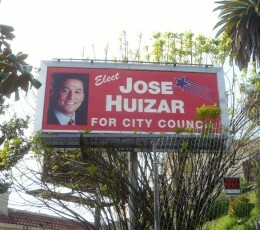 In addition, Huizar is a member of the council’s Planning and Land Use Management (PLUM) committee, which deals with billboard and signage matters, and is expected to take up long-stalled revisions to the city’s sign ordinance after the election. Billboard donated by Lamar Advertising on Figueora Blvd. Lamar Advertising has also proposed a billboard swap whereby it would remove all of its existing signs in exchange for city permission to put up a number of new digital billboards. Any such deal would go through the PLUM committee, whose member Paul Krekorian has also gotten donated billboard space from Lamar, although unlike Huizar he isn’t facing a stiff re-election challenge. Committee chairman Ed Reyes isn’t up for re-election. According to City Ethics Commission records, CBS Outdoor made an independent expenditure of $12,000 on March 2 for billboard space urging Huizar’s re-election. Records show that Parks was the beneficiary on the same day of $7,500 for CBS billboard space in his district. Entities making such independent expenditures on behalf of city candidates are required to report them within 24 hours. Lamar Advertising reported spending $500 each for billboard space on behalf of Huizar, Parks, Krekorian, and incumbent city councilmembers Tom LaBonge, Herb Wesson and Tony Cardenas. The company also donated $500 worth of space to Mitchell Englander, who is widely expected to win election to the seat vacated by retiring councilmember Greig Smith. The Lamar billboards are generally much smaller and in less desirable locations than CBS Outdoor’s. And unlike CBS Outdoor, Lamar currently has no digital billboards in the city.